Juliette Greco brings the French jazz tradition in London. It was an outstanding Juliette Greco concert last 21st November, at the Royal Festival Hall, South Bank Centre, London. 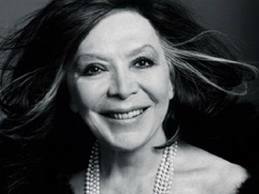 At the end of the show there was a tribute of two standing ovations for the lady who better represent the tradition of the ‘chanson française’, the French modern music. Juliette Greco comes back to London after ten years. This was one of the closing concerts of the London Jazz Festival 2010. The Royal Festival Hall was packed with people, many Frenchs and many English as well. There was also a good presence of young people a sign that Juliette Greco is an evergreen artist. The 83 –years -old singer was superb. She performed with an absolutely brilliant verve, though a minor problem with her throat. She has sung the classics of the francophone tradition like Jacques Brel, Serge Gainsbourg, Leo Ferré. When Juliette Greco finished performing she has been tribute with a standing ovation and called back on stage for an encore. Then she sang the last song and the audience tribute to her another standing ovation. She was accompanied by pianist and husband Gerard Jouannest (Brel’s long-time musical director) and accordionist Jean- Louis Matinier. The atmosphere was dark, the stage set in black, reminding the existentialist life of the singer. Juliette Greco, in fact, had a tumultuous past. She has been on the scene since late 1940s, when in post war Paris she became the muse of many artists namely Jean –Paul Sartre, Miles Davis, Jacques Prévert, Albert Camus, Jean Cocteau. Jacques Brel and Serge Gainsbourg have written songs for her. Juliette Greco is born the 7th February 1927 in Montpellier (France). During the Second World War following her mother and Charlotte, her sister, Juliette was involved in the Resistance. They were caught, her mother and sister were deported but she was not because of her young age. She moved to Paris in 1946 after her mother left the country engaged with the National Navy. Juliette Greco started to hang out at the famed Saint-Germain-des-Prés, the Bohemian Paris quarter, where after the Second World War many poets, writers, painters and musicians were used to meet together living an unconventional life style. There in 1949 she met Miles Davis with whom she became acquainted. In the same year she played a role in the Jean Cocteau’s film “Orphee”. A year later she began her singer career with “Si tu t’imagines” by Raymond Queneau. Since then Juliette Greco career never stopped. She became famous and toured the world as much as she was involved in cinema and theatre. In the 50’s she worked with Charles Aznavour. In the 60’s she met Serge Gainsbourg and Léo Ferré. In 1965 her notoriety reach an insuperable peak everywhere thanks to the protagonist role in the TV serial “Belphegor”, nowadays still remembered, and for which she played a cameo in the remake of the 2001. In the late 1970s her career is running a fast pace and she gets involved in many different activities. Until today Juliette Greco never stopped and in 2009 released her newest album “Je me souviens de tout”.